Our Salted Caramel Milk Chocolate Bar is definitely a modern-day British Classic. We use the finest organic milk chocolate, with caramel and a kiss of Maldon Sea Salt to give this wonderful flavoured bar. Made in a factory which handles nuts, and milk. Suitable for vegetarians. Does not contain alcohol. This bar is GMO-Free, Gluten-Free and Soy-Free. 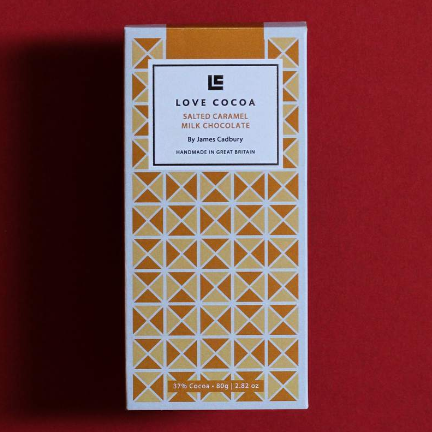 We have more great tasting bars in stock from Love Cocoa. Check out the Orange & Cocoa nibs bar here!